PSP Echo sounds great once you dial it in, with an authentically 'rough' tone. Mimics tape delay well. Hands-on delay time sliders with Ducker keeps the input signal clear. Difficult to be precise with note interval delay times. Tape Speed knob can cause confusion. Presets are poor. No bias control. Anyone familiar with PSP Audioware knows that they do the basics very well, always with a clear user logic and thoroughly professional sound. 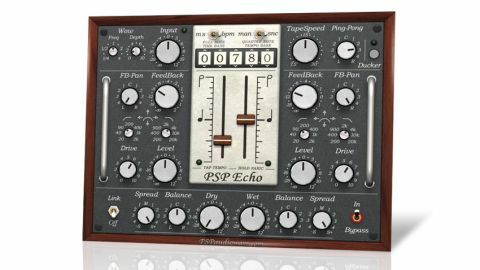 PSP Echo aims to emulate the sort of tape delay that studio boffins of the last century employed to create unique and idiosyncratic sounds, particularly in dub, where the effect was a defining aspect of the genre. "PSP Echo is a two-channel device, effectively two independent tape delays that can be linked and made to interact"
PSP Echo is a two-channel device, effectively two independent tape delays (plus an additional two for the ping-pong predelay) that can be linked and made to interact through feedback pan into the opposite channel. The Tape Speed knob controls the 'global' delay time for both channels: at the standard 15ips (inches per second) the delay display correctly references to the note scale and tempo on the main delay time sliders. Turn it up towards 30ips or down towards 71⁄2ips and the delay times shorten or lengthen respectively. This can get quite confusing, because the display doesn't change to reflect the varispeeding. To avoid potential befuddlment, leave it at 15ips and use the filters for tone and the delay sliders for varispeed effects. The big numerical display is where you set the actual delay time, using a quarter note at 15ips as a reference. It can be switched between milliseconds and BPM, and synced to host tempo or set manually. With the fundamental delay time set, the two Note Sliders can be used to speed it up or slow it down - like most of the other per-channel controls, they can be linked or moved independently, and the scale to the side of each shows note values. This scale isn't notched, though, so you don't know when you're hitting the exact note delay time as you slide. You can click the scale itself to jump to exact intervals, but you don't get control of the varispeed slide time. The side scale also doesn't indicate triplet interval options, which are important in dub. The Ping-Pong knob introduces a variable degree of pre-delay 'flam' to the left and right channels, while the Wow control delivers that wobbly real-life tape experience by fluctuating the tape speed. Each delay channel has the expected Feedback, Filter (high and low-pass) and Drive controls. The last of these might be a little on the polite side for some, though - a bias control would add to the realism. The Ducker, meanwhile, lets you use the input to duck the delay output, shaping the ducking itself with an adjustable envelope. So, for example, you could use it to keep a vocal legible, with the delays only rising when the singer stops singing. It's a very useful inclusion, like having a sidechained compressor on the output of the tape machine. "With a bit of work on the filters, you really can get that tape-like 'gluing' effect"
Finally, the output controls let you mix, balance, pan and spread the outgoing delays. The sound of PSP Echo is every bit as good as you'd expect from the makers of the mighty VintageWarmer, although straight out of the box it's a bit cold, ironically. Even the presets lack the warmth you'd expect. With a bit of work on the filters, though, you really can get that tape-like 'gluing' effect, while the real-time varispeed and delay changes feel very real, as does the Wow. It certainly holds its own well against the pricier likes of UA's Roland Space Echo emulation, which, at this price, is an impressive feat.